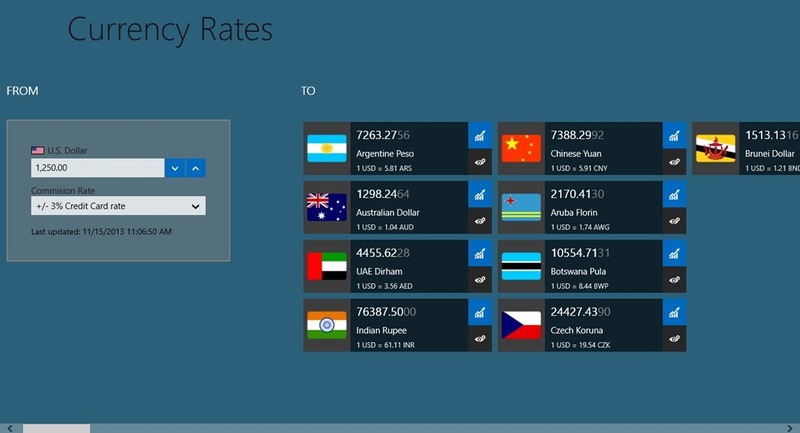 Currency Rates Converter is a free Windows 8 Currency Converter app. Using this free app, you can conveniently check the equivalent value of any particular amount of money in another currency. Here, you can even specify the exchange rate which is to be considered while converting. This Windows 8 Currency Converter has support for converting a number of currencies like American Dollar, Euro, Swiss Franc, Canadian Dollar, and many others. 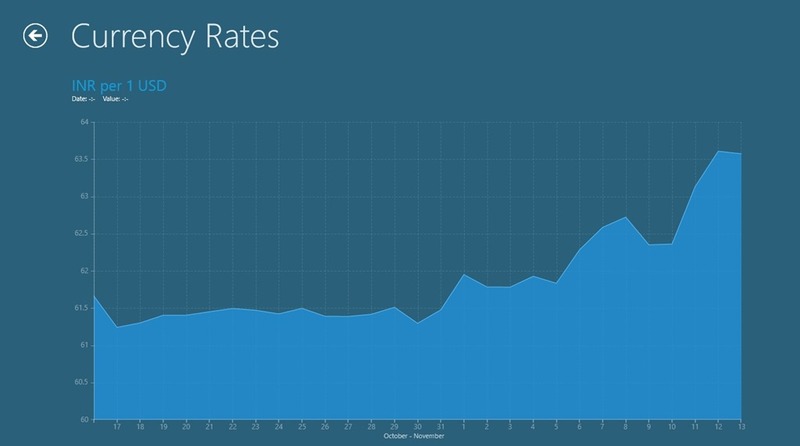 You also get the capability to see how the exchange rate of the currencies has varied for the current month. Also, in addition to all this, you also have the ability to create a tile showing you the conversion rate for any two currencies, and can pin that tile to the start screen from where you can see it anytime. This Windows 8 Currency Converter is freely available in the Business category of the Windows Store. As you land into this free Currency Converter, all the available currencies for which you can convert are available, categorized according to their name initials. You just have to specify the currency from which you want to convert, the currency to which you have to convert into, and the exchange rate. Now, at first sight, this Windows 8 Currency Converter may seem to be somewhat complicated, but once you have used it for some conversions, then you will quickly get used to it. From the landing page of this Windows 8 Currency Converter, firstly choose a currency for which you have to make the conversion. As you choose it, it will be added to the From Text box of Currency Rates Converter. After that, choose some currencies to which you want to convert. These currencies would add up under the To category of the app. After that, as you specify the exchange rate and amount, the converted value for each will appear in the tiles for the currencies. This Windows 8 Currency Converter even gives an option to check the currency conversion rate that has been followed in the market for the entire month. For that option, use the option for it present in the currency tiles. Two options are there for all the currencies. Using the first option, you can see the rate. When you use this option of this Windows 8 Currency Converter, a graph will show you the rates. Hover your mouse over the date for which you want to see the exchange rate, and the rate will be displayed on the top of the graph. 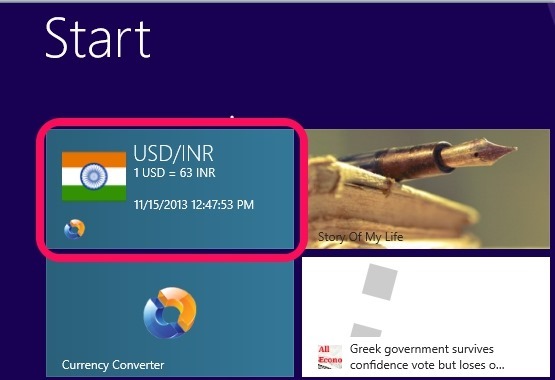 You even can use the pin functionality of this Windows 8 Currency Converter to pin the conversion tile on the main screen. For that you can right click on any tile, and can use the pin option from the bottom flyout. Interface of the app is quite nice. 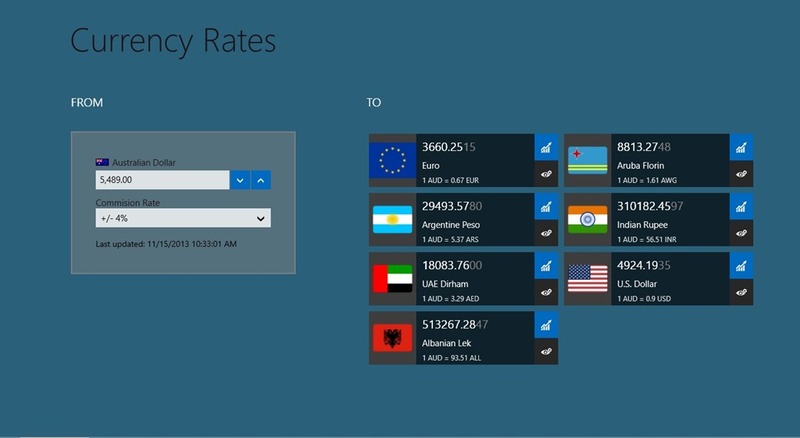 Make live tiles for the Currency exchange rates. You can convert to multiple currencies at the same time. According to me, this is a nice Windows 8 Currency Converter. Its feature to convert multiple currencies at the same time is quite nice. Plus, the ability to make a tile for the rate and to pin it to the start screen is quite nice. Try it for sure and share your views with us. Get Currency Rates Converter here.